EBay can throw up all sorts of challenges sometimes. Some of us might look for ‘mint and boxed’ models for our collections. Some may look for that not quite perfect example for competition and as a class car which will eventually sustain a degree of damage, it’s not too important that it’s all there. And then there are the out and out challenges. Some people buy up ‘scrap yards’ on the premise that eventually , down the road, they will have enough parts to reassemble models with each successive purchase. This particular model was part of someone elses purchase. A job lot of cars for spares. Amongst the lot were some highly collectable models and this particular one was a body shell at best. My friend asked me if I had a use for it and on inspection it contained, undamaged, all the necessary parts to form the building block of a nice model. The chassis was complete, if a little butchered at the back. The motor pod was intact and the guide hole was undamaged. The model also came with a set of axles and anodized wheels which although inappropriate were fine to get the model running. Lastly, the interior was intact. So this is not really a scratchbuild, more a renovation of a model bound for the recycling bin! Proslot models are every bit as competitive as modern models in non magnet situations even though they are as much as ten years old. 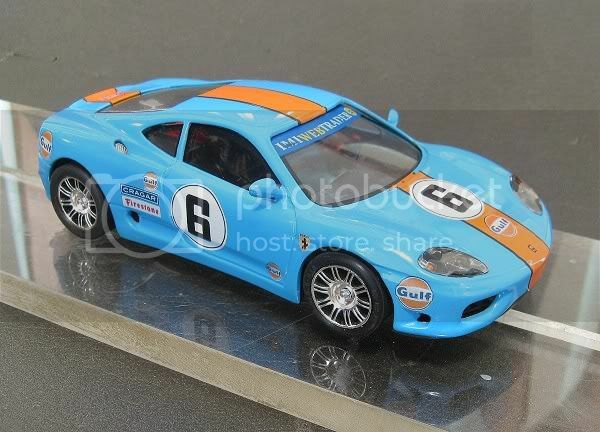 They were one of the first modern manufacturers to decipher the hidden mysteries of the modern mass produced RTR slotcar chassis and their components, and as such were one of the original bench markers in the hobby. With all the vitals intact it was time to decide what it would be? I wasn’t really sure of what livery to give it and I scanned Patto’s website for ideas. 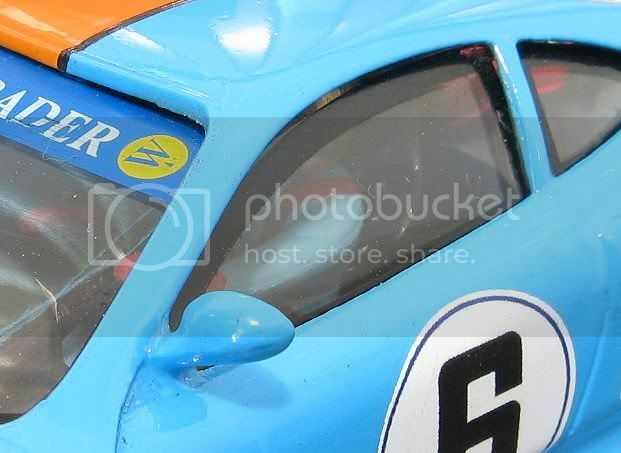 It could have so easily been a Jagermeister or a Hasseroder or Martini or a host of others, but, a chance click on a web link took me to the Aston Martin racing web site and there was a picture of the real 1/1 Gulf DBR9!! 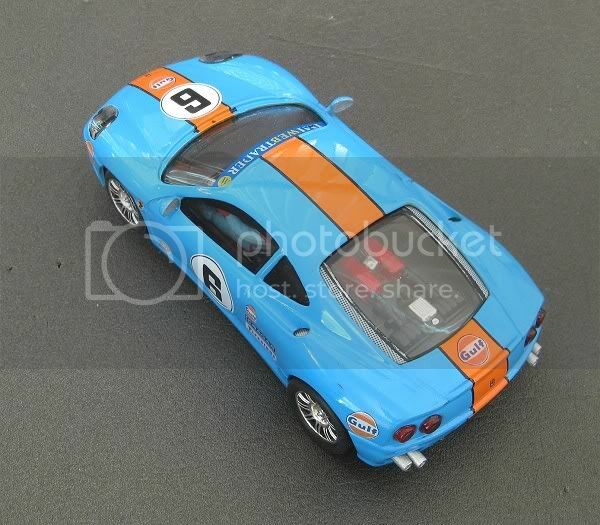 Not having ever seen a Ferrari, let alone a 360, in Gulf colours, I settled for this fantasy livery. 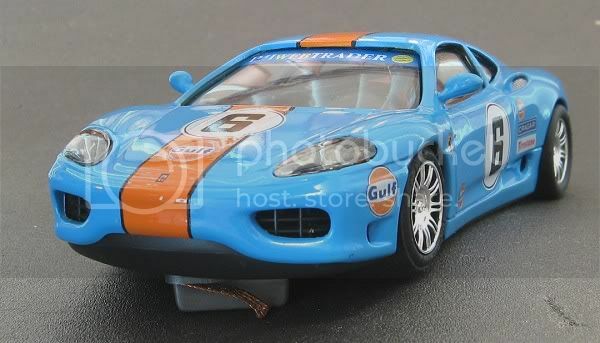 It is unlikely that Ferrari will ever be seen in Gulf colours so it makes it a bit unique. First up was the hardware. 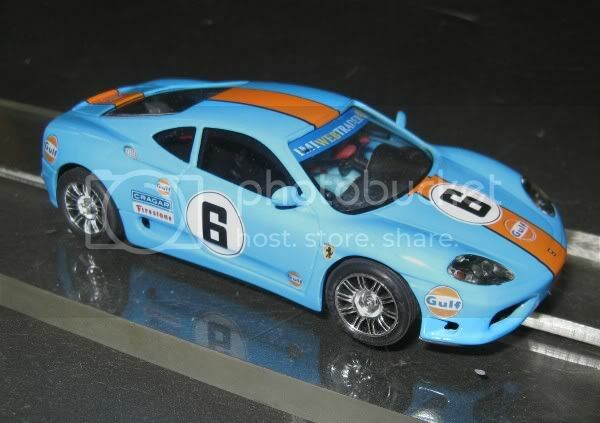 Motor choice was a discarded Revell / Monogram motor from an NC1 converted Sebring Corvette. These motors must rev at about 20,000 rpm at 12 volts! Tests prior to its installation saw it propel the model at ballistic speed. Far better than an NC5 and more like a red Slot.it! Next was the gearing. I plumped for a Slot.it pinion and spur gear. Wheels aren’t Proslot and were the ones that came with the model but I am planning to change them for some Ferrari five spoked wheels at a later stage when I have located some. 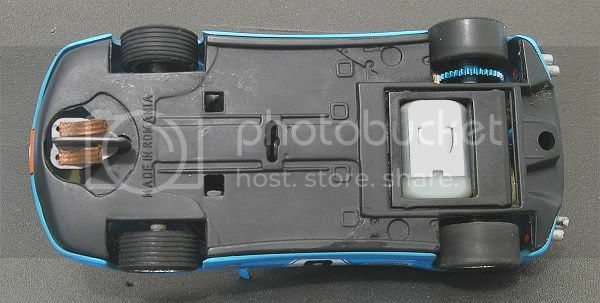 Rear tyres are Slot.it P6’s and the front tyres are some old hard SCX ribbed tyres. The front axle is the patent ‘Wixle’ system of decoupling front wheels and the chassis was finished off with a Ninco guide shimmed down for maximum slot penetration. Caustic soda wouldn’t shift the paint but I did leave the model in a caustic bath for several days to try. Next up was a bath of brake fluid! This had the effect of softening the paint. It was removable with light scraping but I didn’t want to mark the body, so the next concoction was a lengthy dip in methylated spirits. This achieved the desired effect of removing most of the paint with a stiff tooth brush. Remaining spots were removed with a wooden spatula to minimise marking the body. With the paint off the whole body was lightly sanded and then given a spray coat of Tamiya neutral grey. Blemishes were sanded and faults were filled and the paint touched up once more. The undercoat was rubbed with some coarse linen. This had the effect of removing any dust specs from this coat. Next was the body colour. This was to be a mixed paint. Gulf blue is quite distinctive in itself but when I was mixing the colours I was quite taken with a slightly deeper blue with a more ‘electric blue’ sheen. The model then had its first coat of colour. This was left to cure for several days and a second coat was applied. Next up was a thinned coat of clear. Once cured, I masked the orange stripe. This was done by applying a strip of twelve mil clear tape to the body as a guide and applying Tamiya masking tape to both sides. On to this was placed conventional masking tape to protect the rest of the body. The stripe ended up with two coats and once cured the stripe edges were masked in preparation for the black pinstripes. This was done once again with Tamiya masking tape but this time the black was applied with a paint brush. This alleviated the need for overspray protection masking. Attention to detail when masking can not be overstressed! Some of the body contours will cause the tape to lift if you aren’t careful, causing unsightly bleed lines into the body colour. My solution is to apply the tape to the contours with the point of a pencil sharpened piece of six mil dowel as I go along. Trying to close the gaps after the tape has been applied isn’t going to work. Each contour has to be sealed as you come to it! Once happy with the masking, and as a form of insurance, I brush a thinned coat of clear along the masking edges. This will seal them and prevent any further paint ingress under the tape. If the clear bleeds under then its not important as it hasn’t stained the colour coats!! Simple! Lastly, with the pin stripes on and dry, and using the point of a sharp hobby knife I remove any blemishes which may have occurred and touch in the paint with a fine brush. Hopefully this should be minimal, if at all! Another coat of thinned clear was applied and once dry the decals were added. A week later the model had its final coats of clear. This will help protect the model from those ‘racing incidents’ and hopefully give it a good sheen too! The original lights were in a bit of a mess and the simple solution was to replace them, but where to get them?? Mmmmmm? The solution really was simple. I trimmed some three mil round clear LED’s and after clearing out the holes with a three mil drill and painting the headlight wells, I fitted them in, holding them in place with a small piece of blue tack. Once happy with their positions I epoxied them in place. 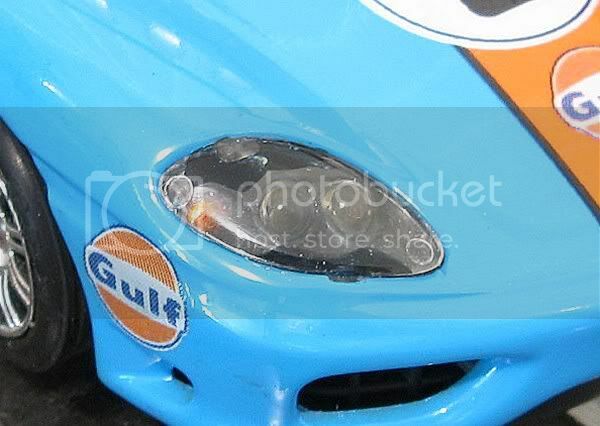 The headlight covers had to be carefully cleaned both sides using Tamiya ‘finish’ cutting compound and a cotton bud. The lamps were refitted and the lugs epoxied from behind. The two outer lamps had a coat of silver and then a coat of ‘clear’ orange before installation. The rear lamps were cleaned up and as these are clear anyway, all they got was a couple of applications of ‘clear’ red. Once dry they then had a thick coat of clear. This gave them a glassy sheen. Once dry, these were tested in position and once the fit was fine, they were epoxied into place. The recess had a hole drilled through it to the inside. This helps the epoxy key to the body by forming a mushroom behind. The model was stored vertically on its ‘lolly stick’ to prevent the lights moving while the epoxy cured. The clear parts like the one piece screen were dipped in metho to free up the strange coats and colours it had on it. Fortunately it left behind the original tampo of the sun strip and the black masking lines and ten minutes with Tamiya finish and a cotton bud once again had the screens gleaming. Also, the engine detail on the driver’s tray was repainted. The original had been applied in probably fifteen seconds and was unconvincing to say the least. The new paint job looks quite effective under the rear screen. While all this was going on and between carrying out various stages on other models in hand, the driver and interior were prepared for their return. The driver’s tray is black so that was one problem out of the way. The driver was repainted flat grey and then pale blue. The seat was painted satin black and reglued once dry. Things like small detail in the cockpit were picked out in various colours and the driver was then reglued into place. Last paintjob was to paint the door mirrors silver and give them a coat of clear. 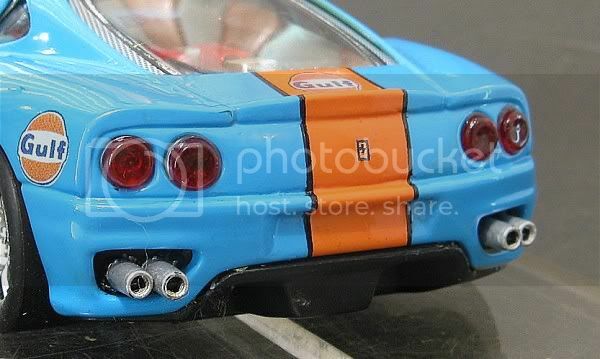 On this model the exhaust tail pipes had been brutally cut off the chassis. But they had been glued into the body. I removed them from the body and painted them. They were then blue tacked in place on the chassis and reset in position. Once in the right spot they were epoxied from behind to fix them in place. This was almost the final steps. Getting the chassis to fit comfortably in the body and trimming up the epoxy glue spots saw the model’s chassis clip neatly in place. The chassis is not a loose fit in the body and as It will probably not be a competition car, I have not gone to the lengths of ensuring the chassis floats in the body. So what to watch out for. Firstly, I have used acrylic paints, I like these as they are brighter colours than the enamels paints. Plus enamel paints seem to yellow with age? The drawback is that if you put acrylic on too thick it can be a handling nightmare. In warm conditions it will take fingerprints readily and as the weather warms, so, softer the paint becomes. It can even pick up marks from anything touching it when left resting in a race box. The small detail is painted in enamels as acrylic doesn’t seem to go on well with a brush. Contrary to what I have read, I haven’t had any problems with the two media interacting and crazing. I use high strength epoxy and this can take a couple hours to set stiff and a day to harden properly. When using it you need to ensure it isn’t going to run somewhere you don’t want it when your back is turned. Another gluing solution is to apply a small spot of superglue to a piece you are gluing. This will hold it in place while the main glue is drying. But most importantly, don’t be in a hurry. There is no necessity to ‘Race ‘em while they’re wet!’ as some people seem to think. I hope you have learned something from this little exercise, and if you have suggestions as how to improve some of the processes, please feel free to add a comment to this article. With help from good friend Kev at Scalex world I have managed to upgrade the model. Finally being able to fit the correct wheels for the model. Well done Kev.